Fight, Beck, for everlasting crowdfunding! A high profile game like Mighty No.9 is going to be subject to some real scrutiny, no matter the quality of the actual title. I mean, we’re used to good and bad games that are funded by relatively faceless publishing houses, but when a game is Kick-started and mostly crowdfunded by everyday folk? That’s a lot of burden for any game to be under. Especially when it’s a spiritual successor to a series that only exists through nostalgia and past glories, due to a publisher that has little to no faith in its IP. But here it is: Mighty No. 9 has taken many years to get here, but if you are looking for the next Mega Man; it’s right here and if you squint a little bit, you could well be mistaken that Capcom have brought the Blue Bomber out of cold storage. In most Mega Man games, the protagonist Rock has to rescue the world from eight malfunctioning robots who you can tackle in any order, while backed up by his creator (Dr. Light) and other allies such as a female robot named Roll. After beating each robot boss, you gain their weapon, while each robot is weak against another boss’s weapon. In Mighty No. 9, the protagonist Beck has to rescue the world from eight malfunctioning robots who you can tackle in any order, while backed up by his creator (Dr. White) and other allies such as a female robot named Call. After beating each robot boss, you gain their weapon, while each robot is weak against another boss’s weapon. As you can tell, the similarities are practically lawyer-baiting, and it’s almost to Mighty No. 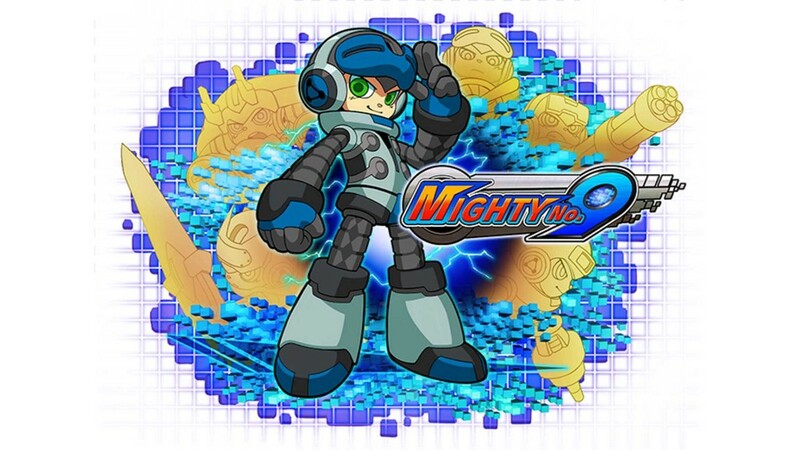 9’s detriment, as the thought of this being a Mega Man game with a different character is never far from your mind. Beck does indeed control like Mega Man, more specifically the X incarnation of the character. While he’s missing X’s wall grab abilities, Beck does retain X’s dashing moves, in fact this is a major mechanic. Different types of dash can be used in the air, to dash under projectiles (yes, Beck can duck!) and quickly land on the ground. But this isn’t all, depleting an enemy’s energy will put them in a state where they are weaker and surrounded by a coloured aura of “Xel”. A few more hits will finish them off, but Beck can dash near them to finish the job as well as absorbing their Xel in order to temporarily become stronger, with different colours offering different bonuses, and in some cases they’ll even replenish his health or store it for later. It’s in these absorption mechanics where Mighty No.9’s high level play comes into effect, as the longer an enemy is in their “destabilised” state, the lower percentage of power can be absorbed from that enemy. The game encourages you to efficiently destabilise, absorb them at 100%, and continue to chain perfect absorption rates for as long as possible, earning you points and better rankings. More so than any other Mega Man release (save for possibly the handheld Zero games), being skillful is incredibly important. After sailing through the relatively easy tutorial level, it took me nearly an hour and a half before I even finished a normal level. I went through several stages, falling to each one’s robot boss, before eventually taking down one of them with my standard shots. Once I had one boss weapon, the majority of the game was a breeze, especially when the game practically tells you what weapon works best on each boss. And those weapons seem somewhat underwhelming, with very little imagination put into them. Only the final boss truly challenged me, but getting from start to finish ultimately took little more than a few hours over a weekend. Outside of the story, there are plenty of extra modes including Challenges, a Boss Rush mode, Leaderboards, Solo challenges, and various online co-op/competitive modes, which are OK additions but come across as filler to make up for the shallow story. The length of the main game mode is one thing that’s possibly too similar to Mega Man, although rather than the game’s length itself, it’s the inconsistency in Mighty No. 9’s difficulty that could possibly be the real problem. While it lasted, I had a pretty good time. Admittedly, bosses take far too many hits to kill at times (and replenish their health while destabilised, so you need to absorb them quickly), and while it was all over far too quickly, it brought back all of those fond memories I had of playing similar games on the SNES. It reminded me how great a premise they are, and that there’s still a place for them. While Capcom clearly don’t agree, it’s heartwarming to see that there are plenty of fans out there that were so open to the idea of a spiritual successor that they put their money where their mouths were and helped make this project a reality (and if you were one of those people, the credits are so long that there is an highlighting function for finding your name in them; which is a nice touch). Mighty No. 9 completely understands what fans love about the genre. 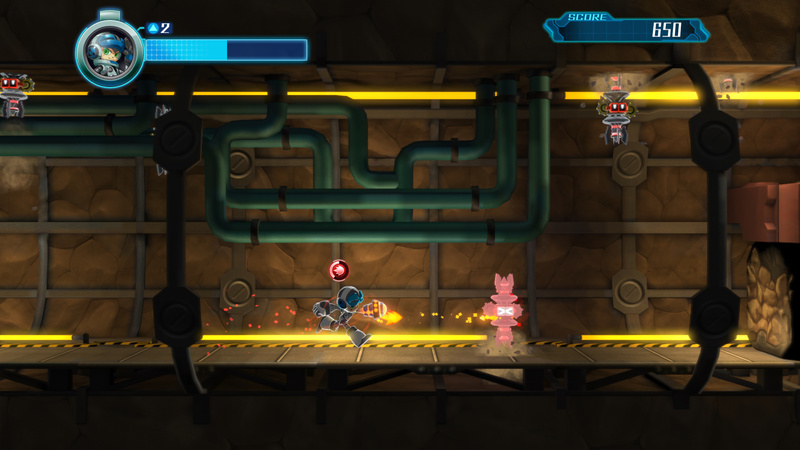 The hand drawn artwork and design of the characters themselves hark back to the X series, while the environments are a grab bag of areas that would happily fit into any of Rock’s adventures – although as a result, the various robot bosses and their associated levels feel incredibly recycled and uninspired. While the story isn’t particularly engaging, the spoken dialogue is delivered in a manner that suits the style, and the soundtrack is particularly wonderful and authentic to its roots, featuring tracks composed by many former Capcom musicians. Oh, and from the very start, you can switch the entire game to an 8-bit style soundtrack that is just wonderful. Rather appropriately, nerd rapper Mega Ran contributes a cracking track to the game as well. After all the hype, controversy, and delays, the end results are satisfying. Some may be turned off by the shortness of the standard game, others may be turned off by the toughness of some of the bosses, but there are plenty of nostalgic and challenge-seeking players that will get a kick out of Mighty No. 9. There’s a hope in me that there’ll be a sequel, one that really pushes the formula forward, but for now, this is just another Mega Man game – make of that what you will. Mighty No. 9 follows the Mega Man formula to a tee, and that’s both a blessing and a curse.